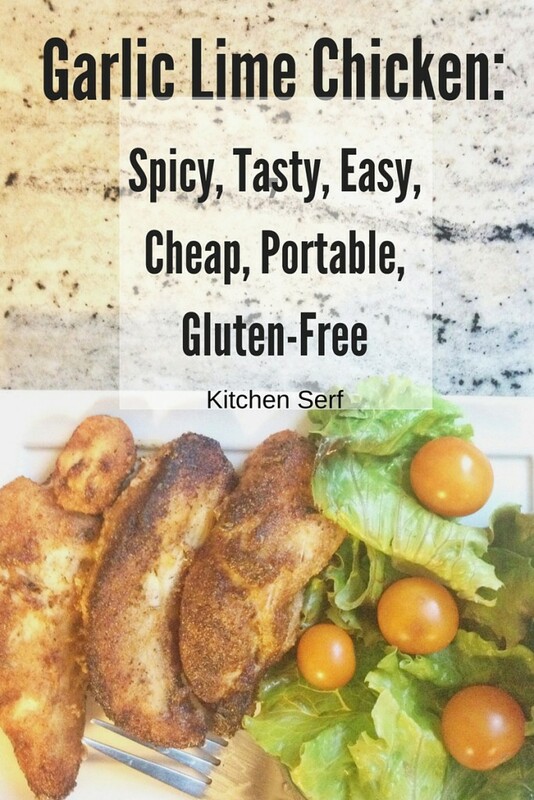 Garlic Lime Chicken is spicy, tasty, easy, cheap, portable and gluten-free. Meet the recipe that’s like a fourth member of our family. Recipes come and go like the wind, fall in and out of favor with you and your family but really reliable, delicious recipes, like the one I’m about to share with you for Garlic Lime Chicken, last forever. This Garlic Lime Chicken should be called magic chicken because everyone who tries it loves it. My husband calls it the best chicken he’s ever eaten in his life. I always have to make extra so there are leftovers for him to take in his lunch. I got the recipe over 10 years ago from a now defunct cooking column in the newspaper where I work. Garlic Lime Chicken is made by coating boneless chicken breasts with a spicy rub then cooking them in a skillet with a few tablespoons of oil and butter. Once the chicken is done cooking, you set the chicken on a platter to rest and make a sauce with chicken broth, fresh lime juice and the spices and butter left in the skillet. We like a good amount of spice so I usually double the rub mixture. If I’m cooking enough to have leftovers, I quadruple the rub. You mix about five spices plus salt and pepper to make the rub. If you don’t have a fully stocked spice drawer/cabinet/pantry yet, see this post about purchasing spices. I usually serve Garlic Lime Chicken with roasted sweet potatoes or sweet potato heaven or garlic mashed potatoes and a salad. Sweet potatoes are best though. Tell me your favorite chicken recipe. Feel free to share a link. Just five spices, in addition to salt and pepper, sprinkled on chicken breasts, which are then sauteed, will give you a delicious dish. 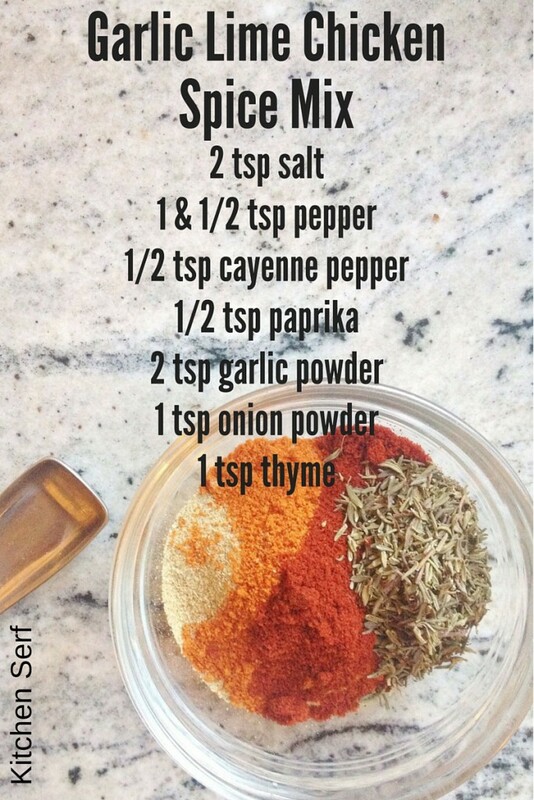 Mix spices together in a small bowl. Sprinkle a bit of the mixture on each side of the chicken breast and rub in. Heat butter and oil in a skillet over medium heat. Saute chicken until golden brown about 5 to 6 minutes each side. Add lime juice and chicken broth to the pan, whisk up the browned bits off the bottom of the pan. Cook until sauce has reduced slightly. Return chicken to the pan and cook two to three more minutes until chicken is thoroughly coated with sauce. Garlic Lime Chicken is a recipe I’ve been making regularly for over a decade. This spicy, flavorful chicken breast will make you feel like you’re eating dinner in a four-star bistro instead of your dusty dining room littered with toys. If you enjoyed this post, would you share it on Pinterest?